- my absolute favorite! | Clutch (sold out, similar style here & here) Necklace | Earrings | Cuff | Sunglasses - under $10! We spent the weekend at the newly remodeled Four Seasons Hotel Houston. Although it's only a ten minute drive from our house, our staycation was just what the doctor ordered. I mean who doesn't love playing tourist in their own city? If you've checked out my Instagram (be sure to follow along if you don't already). you definitely saw some of the fun we had at the hotel on my Insta Stories! I don't want to share too much because I'll be doing a full recap of our stay this Friday, so be sure to stop by for all the details! Schools out, temperatures are soaring, meaning summer is officially in full swing, and so is summer travel. Whether you're heading to the lake, visiting family across the country, or jet setting overseas, a maxi dress is the perfect travel companion. Maxi dresses are so comfortable and make traveling a breeze. Plus, you can wear them casually (like I did above) while you're en route to your destination, and once you arrive you can spritz on some perfume, put on some wedges, and throw on a cinched belt. You'll look effortlessly pulled-together, and not like you just stepped out of a car, or off a plane. Note: always make sure your maxi dresses hits no lower than right above your ankle. This is the opportune length for any shape and size, and keeps the dress from dragging on the ground (ew), or getting stuck in an escalator (yikes)! Below I've rounded up ten travel ready maxis that are all under $100!!! With so many colors, prints, and materials to choose from, you're sure to find the perfect one for you. P.S. What is it about long weekends that makes it so hard to get back into the swing of things? I had originally planned for this post to be on the blog this morning, but was having computer problems. Womp womp. I figured I'd give it a try posting in the evening, and see how the response is - we shall see! If you're an email subscriber, this post went live Wednesday night (5/31), so I'm sorry you're a day behind! What better way to kick off Memorial Day Weekend than by rounding up all the best sales for you!! With most big retailers offering nearly 40% off, you definitely don't want to miss your chance to snag some of the things you've been eyeing online (or in store) recently. One of the biggest sales going on now is the Nordstrom Half Yearly Sale. This is without a doubt the biggest - dare I say best - sale of the year. With everything on sale from statement earrings, to bar carts, rain boots, and things for him (ahem Father's Day is just around the corner), be sure to check out all they have to offer before everything is back to full price on June 4th. Click here to shop. Also, entire outfit is on sale! It's from Banana Republic, and this weekend you can take 40% off your purchase when you use code BRSUMMER. I mean how cute are these embellished "sailor" shorts?! Shop them here. I recently wore this Trina Turk dress when I was in Vegas last month, and got so many compliments on it. I had posted it on Instagram and got a lot of questions too, so I figured I'd make it into a blog post! This dress was one of my favorite pieces from last year's collection. I bought it in white as well, and my only regret was not purchasing the tangerine color it came in, too! Unfortunately, since it was from last season, it's no longer available. That being said, I did track it down here, but there literally is only one left in a size medium. Get it while you can!!! Even though this exact dress is no longer available, I've linked two that are almost exact here and here. I've also rounded up twelve of my other favorites below. 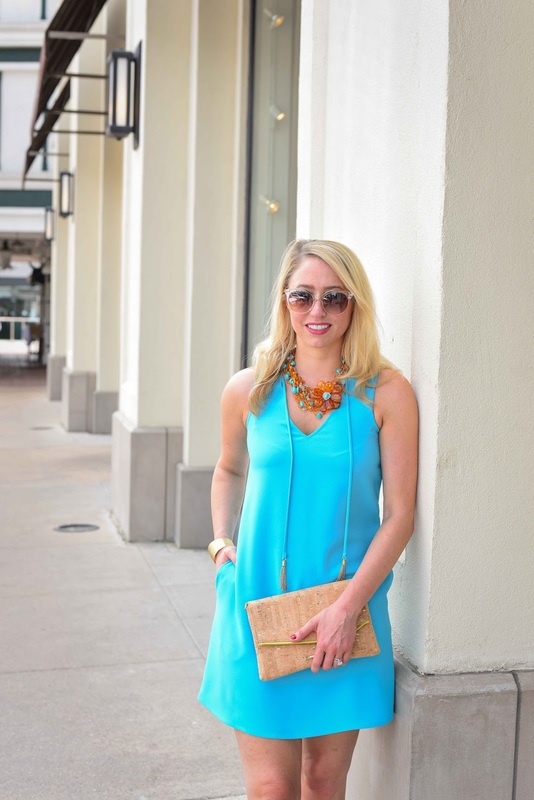 What I love about the A-line cut of this dress is, not only is it the perfect go-to during summer, but it's also great for traveling, and is easy to dress up, or down. The loose silhouette makes it look effortless, plus it's super comfortable. I can't help but laugh at these photos. On Wednesday, my photographer, Lauren, and I photographed seven, yes, SEVEN outfits. Needless to say, after all of the changing and the humidity (it's back), my hair looked kind of like a wet dog. EEK sorry....and this wasn't even the last outfit! Trust me, there are a lot of unglamourous sides to being a blogger. One of them includes changing in your car, when it is 87 degrees, with 90% humidity. Changing in the car is never fun, but when summer rolls around, Lord help me! The fact that I even got through seven outfits is a miracle. 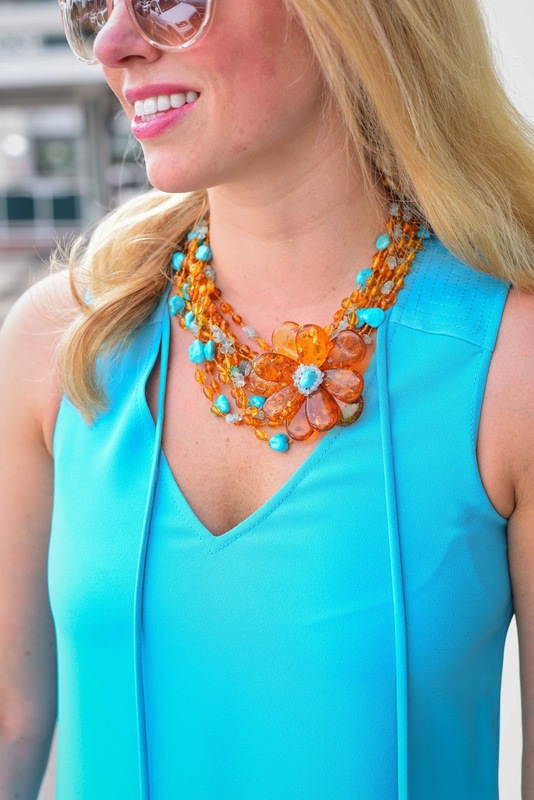 That being said, there is still so much to love about this 'go anywhere' look! The midi length of this dress makes it perfect for all day wear. You'll never have to worry that it's riding up, or if it's too short. Plus, did you notice the little cold shoulder action going on? I love slits on the shoulder, and how it takes a timeless pattern, and mixes it with an of-the-moment trend. 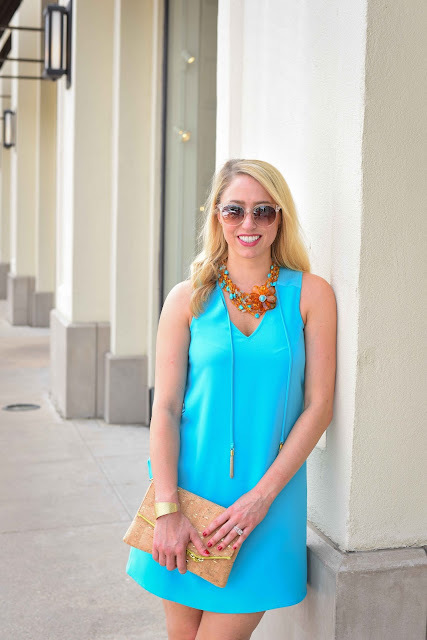 This purse is perfect for summer and was a recent purchase from Amazon! The neutral color scheme can go with anything, and the pom pom appliques are too cute! It comes in larger satchel, that's perfect for the beach, as well as a clutch! I'm debating on exchanging the crossbody for the lager satchel, because let's be honest, I always have way to much stuff in my purse! I feel like anytime I downsize and take a few things out, it's the one time I'm going to end up needing something. Case in point, on Wednesday when I was doing outfit changes, I got lipstick all over a white dress I was wearing. Luckily, I had my oversized tote with me, and my Tide To Go stick came to the rescue. Phew. Thanks for stopping by, and I hope you have a fantastic weekend! Wednesday is here!! How was your weekend? I hope all the moms out there had a wonderful Mother's Day on Sunday. Our weekend was productive, and we got a lot of 'to-do's' accomplished for the house, including buying some trees for our backyard! Luckily we went in having an idea about what we wanted, because to tell you the truth, after roaming around the nursery in the Texas heat for what felt like hours, they all started to look the same. Okay, okay, not the same, but you know what I mean! We settled on three gorgeous five year old Carolina cherry laurel trees (what we had originally planned), and I can't wait for them to be planted and delivered next month. If you've been with Ashley Nicole Style since the beginning, you may recognize this outfit from my very first blog post! Yes, my first one ever! It's crazy to think that it's already been two years next month! Where does the time go?! 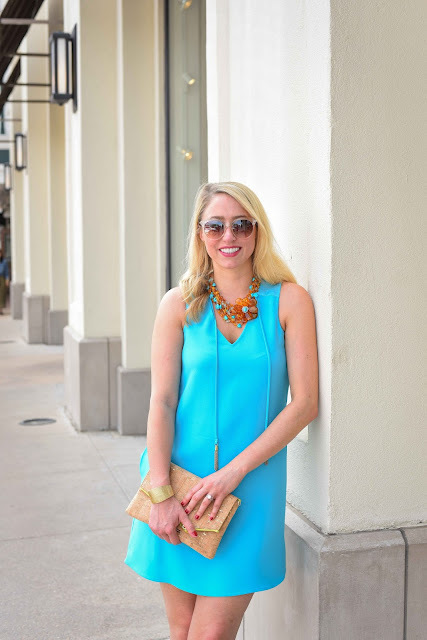 Although I try to never repeat outfits on the blog, this dress is still totally on trend, and I wanted to share it with you (again)! 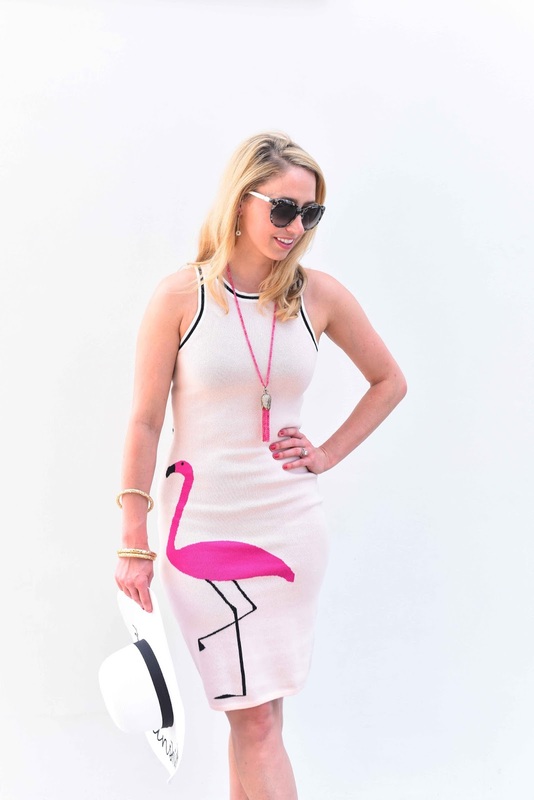 Although this dress is no longer available I've rounded up some fun, summer ready flamingo pieces for you below. From pool floats, to tote bags, pillows, dresses, and shirts, you'll definitely stand out from the flock! For some other fun flamingo finds, head over and check out Kate Spade's surprise sale that is going on now. Prices are up to 75% off, and I'm loving this crossbody bag and this passport holder.